Every so often I get emails that pop into my email inbox that make me excited. 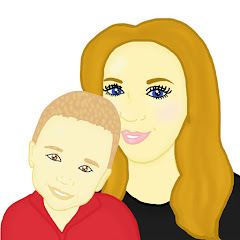 Recently we were sent a email by a lovely company called Wicked Uncle asking if Maxwell would like to review for them. For anyone that has not heard of Wicked Uncle, Wicked Uncle is a online toy shop. Wicked Uncle are a toy shop with a difference. Wicked Uncle sell lots of toys but they are seen as gift's for others. Wicked Uncle stocks gifts perfect for children. Whether this be for your own child, your child's friend, your nephew, grandchild, boy or girl, Wicked Uncle offer an amazing selection of gifts to suit different budgets, needs and tastes. Recently Maxwell was given £40 to spend at Wicked Uncle, after looking at the website together we came up with the plan of purchasing Maxwell the Illuminated Aqua Dragons Deluxe set which was priced at £23.95. We also ordered Maxwell a Doctor on Call - Wooden 7 piece Set which was priced at £19.50. The ordering process was incredibly easy. At the checkout I had to simply type our address details in and then I was asked whether I would like our toys gift wrapped and if I would like a hand written card or a gift label attached to the gift. Due to the toys being just for Maxwell I felt we did not need these little extra's on our parcel however I thought that the gift wrapping idea was fantastic and I was surprised at how little it would cost me to include this extra. After I had made my order, I received confirmation of my order and we ended up waiting just a few days for our parcel to be delivered. When our parcel arrived it was carefully packed and I ended up feeling that the order process and the delivery process had been a exceptional one. As soon as the Aqua Dragon set arrived Maxwell wanted to get it set up however it took us a few days to set it up due to the fact we needed to buy bottled water. Without buying and using the bottled water our Aqua Dragons may not have hatched so it was important that we bought the bottled water. Once we had bought the bottled water we found the process of setting the Aqua Dragons tank up easy to do thanks to the easy to follow instructions which we were sent with the set. 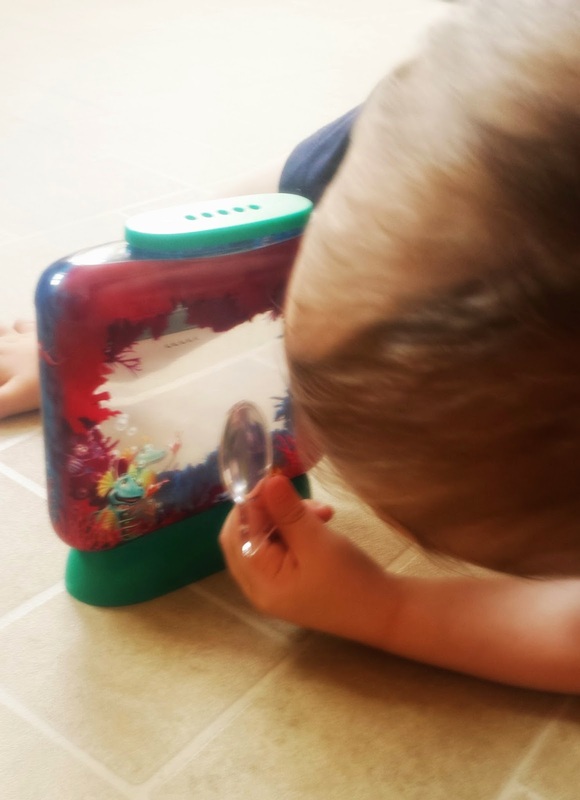 So far our Aqua Dragons are only around a week old and are still babies however they are developing well and Maxwell adores watching them through the magnified glass which comes with the set. Maxwell also enjoys feeding them and making sure there is plenty of oxygen in their water, without these 2 things the Aqua Dragons would die so Maxwell has found a new responsibility. I feel that this is a fantastic set to buy for children. I think this set would be brilliant for children aged 6+ however I also feel it is a fantastic set for children aged 3+ who plan to use this set with their parents help. 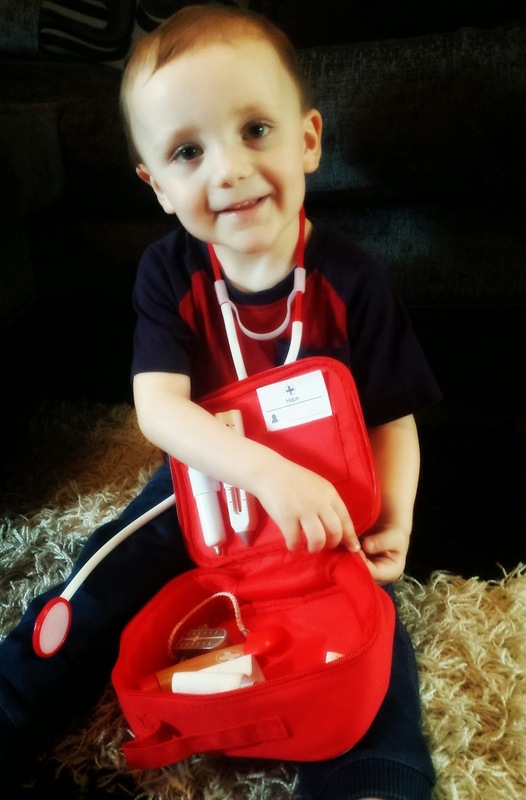 Maxwell's preschool informed us that Maxwell was lacking in confidence when it came to Maxwell doing imaginary play so I thought this set would improve Maxwell's imagination and he would have a lot of fun when using this doctor on call set. The Doctor on Call set comes in a lovely red case and all the small bits have places in the case to sit. The case is small enough to take around the house but it is also a fantastic size to take with you in the car or would be a wonderful extra to take to entertain your child when you are visiting people. The Doctor on Call set is brilliant due to the detail and the amount of pieces which come with the set however the only small niggle I have is that although all the small bits and pieces are wooden, the stethoscope is not. The stethoscope is made of plastic and also has small plastic bits which come off - due to this Maxwell has managed to loose one of the small bits already. Due to the small bits (especially the plastic bits which are removable) I think this set would be appropriate for a child aged 3+ however it may require some adult supervision. Overall my experience with Wicked Uncle was extremely positive. Their website is easy to follow and is clear to read. I love the fact that Wicked Uncle have taken the time to add gifts into age categories and I love the fact that they have split the toys into gender categories. I feel that Wicked Uncle stock a great range of goods at affordable prices for all and I would quite like to see them bring out a adult version of there online store in the future as it is something I would definitely use. However I was sent the products above for the purpose of this review. All opinions in this post are my own.